How do you take a state with an already welcoming business environment and turn it into an economic development juggernaut? If you are Kentucky Gov. Matt Bevin, you reach back into the business sector and turn over the task of economic development to two seasoned executives with impressive track records of accomplishment in private enterprise. Enter Terry Gill and Vivek Sarin, the twin pillars of economy-growth who now helm the Kentucky Cabinet for Economic Development – Gill as cabinet secretary and Sarin as executive officer. Having run successful companies, done deals, balanced budgets, met payroll and bankrolled sizable ventures in the private sector, Gill and Sarin are now bringing to Kentucky’s economic development efforts the mindset and values that propelled their careers and their firms to unprecedented heights. After engineering an economic surge that saw the state land a record-shattering $9.2 billion in capital investment in 2017, Gill and Sarin sat down recently to discuss their unique approach to helping businesses find a welcoming home and a safe capital haven in Kentucky. In most states, there’s one person in charge of economic development. Kentucky has two. How does that work? SECRETARY TERRY GILL: There’s clearly a correlation between the $9.2 billion investment we saw and the fact that you’ve got two people who are co-leading this Cabinet. That level of activity, the size and complexity of those projects really required it. I think the $9.2 billion is a result of having two experienced business people taking charge on behalf of the state. EXECUTIVE OFFICER VIVEK SARIN: Terry and I have had a relationship with each other for many years. So, we have a high degree of trust. Along with the Governor, we’re working side by side to do whatever is necessary to serve the commonwealth and help any deal that’s put in front of us move to a go-or-no-go point as quickly as possible. 2017 was a record-setting year as the commonwealth landed $9.2 billion in capital investment and more than 17,000 new jobs. How was Kentucky able to achieve this, and what do you think this means for your state moving forward? SARIN: Kentucky’s been able to have this type of year for a few fundamental reasons. No. 1 is the leadership of Gov. Bevin. There is no question that since he came into office over two years ago that his leadership has put Kentucky on a path where our doors for doing business have been flung wide-open. Secondly, with the Legislature that we have in place, they have passed statutes that are very business friendly. And thirdly, we are fortunate to have an incredible team here within this Cabinet. They’re very hard working, they work exceptionally well as a team. GILL: There’s also the fact that the governor, Vivek and I all come from the private sector. We’ve all been CEOs of various companies throughout our career and we’re able to assess business needs quickly. When that prospect or client first contacts us, we oftentimes have had direct experience in their industry. We understand the challenges, the risk profile, the capital needs, and the importance of workforce because we have been in that exact same spot before. That helps us assess what a winning formula looks like and then get those CEOs or the site consultants through that process efficiently. I think people appreciate that sense of urgency. 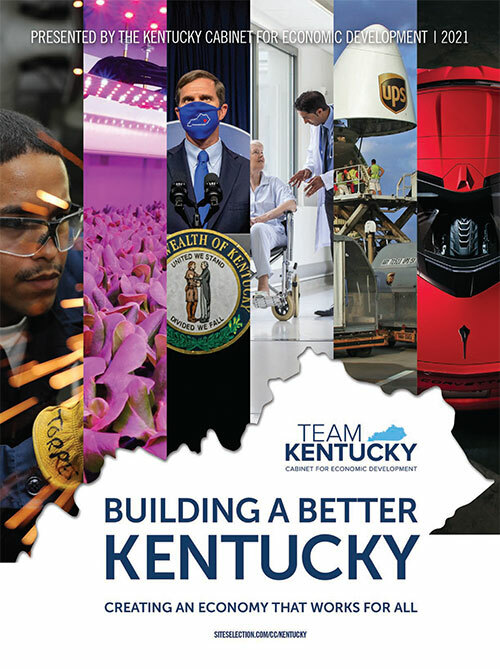 Last year, Kentucky landed three separate billion-dollar-plus capital investments: Amazon, Toyota and Braidy Industries. How were you able to win these huge deals? GILL: They’re three remarkable investments from three very different companies. Our relationship with Toyota goes back to 1987. Toyota’s decision to invest in this plant — the largest in their network – is a reaffirmation of their confidence in the state of Kentucky and their workforce here. This will enable that facility to produce multiple models within the same production plant. Amazon is a completely different scenario. Their decision to invest almost $1.5 billion in Northern Kentucky was really a vote of confidence in not only the near-term business situation in Northern Kentucky and in the state of Kentucky, but also their prospects for where that relationship can go in the next 10 to 20 years. SARIN: Braidy Industries is a remarkable story. This is the first aluminum mill of its kind going into the United States in over 40 years, and what’s beautiful about the story is their decision to locate in Eastern Kentucky in Greenup County. Not only does it play into the governor’s vision of Kentucky being the engineering and manufacturing hub of America, but they’re also locating in a part of the state that has been adversely affected by the decline in coal mining. As they break ground and as they build up, they’re going to provide a great level of employment. The ripple effect of that is going to be felt throughout the entire eastern part of Kentucky. Gov. Bevin’s goal is to make Kentucky the manufacturing and engineering destination of choice for all North America. How is this vision being fulfilled? SARIN: The governor, Terry and I all have a manufacturing background. We’ve all had ownership and hands-on experience in managing and leading manufacturing companies. Secondly, we know that so much of our manufacturing base has moved offshore in the last several decades, resulting in an erosion of good-paying middle-class jobs. For our country to be self-sufficient and for our communities to be vibrant, we need a strong manufacturing base. The governor has very thoughtfully laid out a vision for Kentucky to become the engineering and manufacturing center of America. No other state owns that space. We’re setting out to own it. So, many of the companies that we’re recruiting fit nicely into that long-term vision. Many of these projects are coming from international locations. 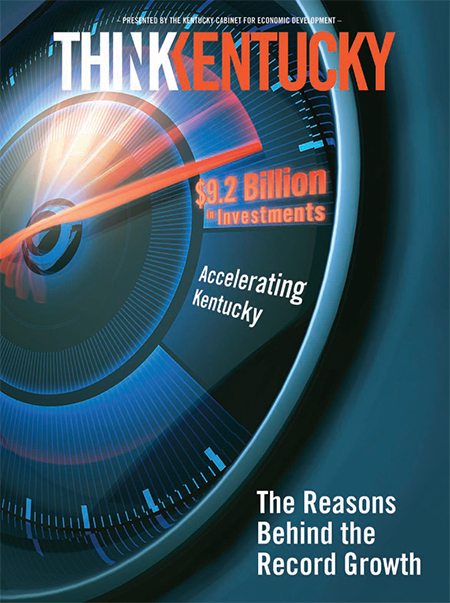 How has the global FDI profile of Kentucky been elevated? GILL: Kentucky’s relationship with Toyota goes back to 1987. That set a framework for the state and its ability to service an international clientele. After they made their decision to build the plant in Georgetown, they obviously began to recruit many of their tier-one suppliers and the global supply chain to come to the state. That was really that moment where I think Kentucky became known on the global stage. Almost a third of the $9.2 billion in capital investment in our state last year came from foreign companies; and almost 40 percent of our foreign direct investment is from Japanese-owned companies, so it’s clear that we have a demonstrated track record of success in attracting and servicing companies from Asia. We also have two offices, one in Tokyo and one in Hamburg, Germany, so we’re intentional about our effort to identify and recruit foreign companies to come into the state. What are you doing on the workforce side to make sure that when these companies come to Kentucky, they’re going to have the workers with the skill sets they need to fill the jobs? SARIN: We’ve been working very closely with Secretary Heiner and Secretary Ramsey to drive alignment. How can our entire educational system be in alignment with what the demands are from our employers, and then how can our schools and universities begin educating and producing a product that is something our employers will want? And how do we retain people in our state and how do we attract more people to our state — and how do we also drive up workforce participation? GILL: The Work Ready Skills initiative is a perfect example of that. As we see more investment in the state, it puts more emphasis on the need to ensure that we have both a near-term steady supply of labor and a longer-term pipeline that you have confidence in. The Governor kicked off the Work Ready Skills initiative last year by putting $100 million into that program. It is a public-private partnership where that hundred million dollars is in effect a grant program where communities in partnership with both the school system and the business community can come together and apply for a grant. Over the course of the year, we had almost $500 million of requests for that $100 million. That’s been a big, big success for the state. Kentucky is also making a concerted effort in the apprenticeships area. What does that mean for workforce development moving forward in your state? GILL: With the skilled trades, there’s a demographic explanation for why that’s in high demand and a consequence of our success in attracting manufacturing companies to Kentucky. It’s not just manufacturing, though. Apprenticeship rolls across the service sector as well, but what we’re realizing is that that young people should have choices. For some, college is not the right pathway for various reasons, but that doesn’t mean that it shouldn’t lead to a very lucrative career for a young person. We’re taking a model from continental Europe and understanding that if we can build a pathway to a vibrant career for a young person that may not include a traditional four-year post-secondary educational experience. It does two things. It replaces a part of the workforce that’s retiring from the skilled trades and then provides our young folks options as they graduate from high school. Both of you, as well as the governor, have spoken in public forums about the importance of community preparedness. How are Kentucky communities responding? SARIN: We’re finding them to be waking up and responding well, but there’s a lot of work to be done. Coming out of the 2008-2009 recession, it’s our experience that communities are still somewhat shy to get ahead of the curve to make the kinds of investments they need to make to be prepared for opportunities. We have some work to do in terms of helping our communities be standardized in their presentation, especially when responding to opportunities from companies that are looking to expand in Kentucky. Right-to-work and red-tape-reduction were just beginning to have their presence felt in Kentucky last year. Now that those have been on the books for 12 months or more, do you expect to see more of the dividends of those business climate reforms in 2018? SARIN: Absolutely. Right-to-work is a qualifying site selection factor for many companies and site consultants, and I think that is a large reason why our pipeline is healthy today. The opportunities are robust for Kentucky now because we’re not being eliminated before even being seen. Now we’re making it further down the decision-making process and we’re getting an opportunity to tell our story. It’s a great story and Kentucky is a very easy state to market because of its richness on so many accounts. When people are given the chance to seriously evaluate all aspects of locating in Kentucky and living here and operating here, they’re finding a diamond in the rough. If each of you had one message to deliver to the business community about your state, what would that message be? GILL: We have a deep commitment to your long-term success. This is not a transactional relationship. We’re looking for success that is measured in longer increments than just quarterly earnings, and you can be confident that if you make the decision to invest in our state, you will have a partner that’s going to be here for the long run. SARIN: You have a governor and an economic development team that are all CEOs by trade here serving for a short period of time to make a positive impact. If there was ever a time in history to get engaged in Kentucky, it is now. Come help us make this state more business friendly. Help us drive forward the kinds of improvements that would be good for our communities and be a part of the solution.